After participating in SIGCHI Across Borders events, we proposed and ran a workshop in CSCW 2018 to (i) identify where CSCW and social computing research was being conducted in and about Latin America (LatAm), (ii) characterize its common themes and methods, and (iii) envision a shared agenda that could make LatAm-centered CSCW research more visible and impactful to the international community. The workshop accepted 12 position papers from 40 authors coming from six countries. 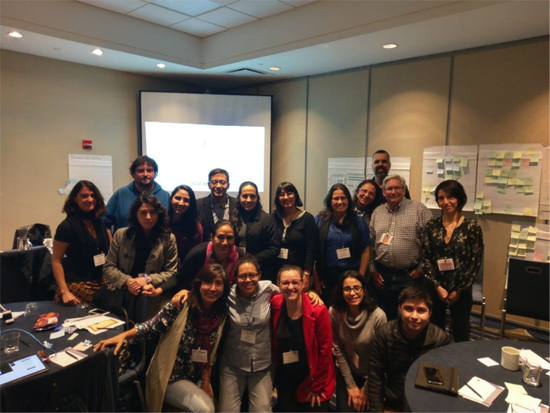 Thanks to a SIGCHI funding, 12 authors were able to participate in the workshop, present their work, and collaborate in describing CSCW research in LatAm. Pernille Bjorn (University of Copenhagen) and David Redmiles (University of California, Irvine) volunteered to serve as senior mentors, who introduced key issues in doing CSCW research, advised the workshop participants’ projects, and worked with all of us to pinpoint opportunities and challenges of doing CSCW research in LatAm. What follows is our summary of what we were able to collectively produce in the workshop. Workshop participants at the end of the event. CSCW research is being conducted in, and about, several LatAm countries; however, there are only a handful of small research groups in each country. Our ever-evolving map of LatAm-centered CSCW research (below) also shows a larger number of CSCW research groups in Brazil than in other countries of the region due to Brazil’s larger geographical dimensions. 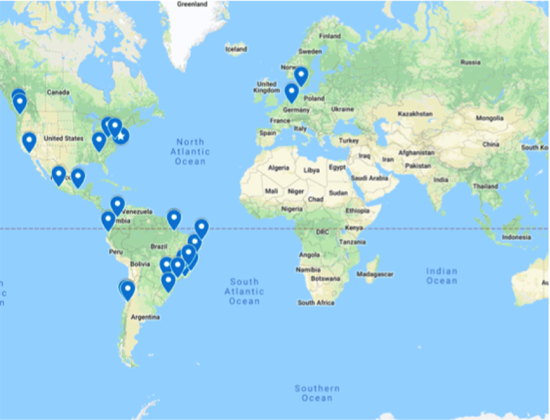 There are currently only five ACM SIGCHI local chapters in LatAm: Brazil, Mexico, Guatemala City, Quito, and Santiago-Chile. Across countries, the research groups have few members. In most cases, they are sustained by a single principal investigator working in a computer science or informatics department. Their research teams are often composed of a majority of undergraduate students and a few graduate students, if any. We have not yet identified CSCW research groups with multiple researchers working in a single center or institution, although there were some local and regional efforts in the past. These aspects make us conclude that CSCW research is still scattered across isolated small research groups in LatAm. To strengthen these groups’ work and impact, we believe that it is crucial to establish various collaboration channels among them to create a more robust research infrastructure than the current one. We imagine an infrastructure that leads to richer, shorter feedback cycles during the research process. An infrastructure that can emulate the dynamics of a large research lab with collocated researchers and apprentices of diverse backgrounds and levels of experience. Given the strong focus on undergraduate education in LatAm, this infrastructure should also encompass an effective involvement of undergraduate students in the research process as part of their education. Designing for contexts with characteristics that are rare in countries where HCI research already thrives and, therefore, whose influences are insufficiently understood. For example, some CSCW research about LatAm is situated in young or unstable democracies, or in countries with high-income inequality, diverse levels of literacy and technology access, strong socioeconomic class segregation, and high crime rates. Other projects involve technologies in settings where close-knit extended families or long-distance family relationships due to immigration are common. Designing “against the system” and “beyond data access” to propose alternative configurations for current work and data practices. This includes initiatives that leverage technology affordances to engage users in countering corruption in particular public institutions, strengthening civic participation, or gathering reliable data where official data is not collected or is not accurate enough. It also involves understanding data practices and concerns in such contexts, including various aspects such as trust, privacy, and safety. Looking for insights on and beyond cultural differences to develop nuanced interpretations of the results of studies centered on LatAm. While cross-cultural frameworks are a common focus, other foci such as stigma and inclusion are being explored as well. Interpretative research methods are often used as a means to reach a deeper understanding of the phenomena under study. While both qualitative and quantitative methods are used, there is a tendency to lean toward mixed methods when quantitative approaches are used. There is also a trend to use participatory design and critical design perspectives in order to seek a deep level of understanding. We believe that these aspects warrant a call for more attention to LatAm as a place for CSCW research. While LatAm research is not yet widely published in ACM SIGCHI venues, it is tackling relevant issues that need to be further investigated. Based on the current state of CSCW research in LatAm, we see opportunities to foster a research community centered on LatAm that can create new opportunities for mentoring researchers to disseminate their results, train more people to expand the depth and scope of current research, build networks to share lessons learned, and leverage local efforts to a regional level. These opportunities do not come without challenges, including well-known financial shortages in our region, which we believe are structural and can hardly be addressed by researchers' articulated efforts. There is also a language barrier. As English is a second language for most researchers in LatAm, writing compelling stories that best convey the richness of their findings continues to be a challenge that is often not taken into consideration in the review processes. Additionally, national research centers in most LatAm countries continue to value only publications indexed by Web of Science. Unfortunately, the majority of ACM SIGCHI conferences are not indexed by it. Thus, currently, CSCW researchers in the region have to consider trade-offs between what is recognized by their peers nationally and having a worldwide presence in their discipline. Finally, there is also a trade-off between our research being locally impactful versus globally relevant. For many of us, our nearby contexts provide plenty of opportunities to make a significant change by means of our research and work. Finding the right balance between making these kinds of contributions to our communities and being part of cutting-edge research in the discipline has become an additional concern. Overall, we are very much hopeful that characterizing CSCW research in and about LatAm, its opportunities, and its challenges is a key starting step to engage in more effective efforts to strengthen it and make it more visible to the international community. We are currently working on a five-year agenda to increase mentorship and networking opportunities within the region, which we believe will be instrumental to increase the presence of our region in future ACM SIGCHI venues and the dissemination of CSCW LatAm research.